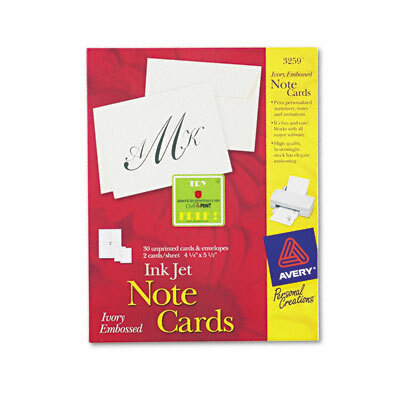 Ideal for birthday and holiday cards, invitations, announcements, monogrammed stationery, place cards, awards and more. The high-quality, heavyweight stock and special two-sided coating maximize ink jet printer colors. Microperforation and premium scoring allow for easy folding and clean, neat edges. Cards are easy to format with any desktop publishing software. Guaranteed to feed easily through all popular ink jet printers. Ideal for birthday and holiday cards, invitations, announcements, monogrammed stationery, place cards, awards and more. The high-quality, heavyweight stock and special two-sided coating maximize ink jet printer colors. Microperforation and premium scoring allow for easy folding and clean, neat edges. Cards are easy to format with any desktop publishing software. Guaranteed to feed easily through all popular ink jet printers.